The Housing Executive’s (NIHE) annual count of rough sleepers in the Belfast area has found a 220 per cent increase in the number of those sleeping on the streets, while recent figures released by the Department for Communities (DfC) outline over 18,000 households presenting as homeless across Northern Ireland. 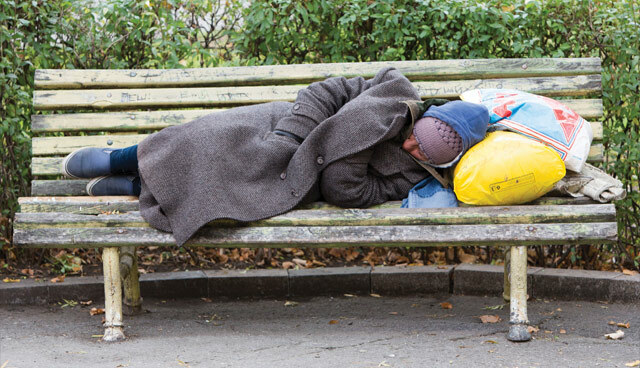 The count, done between the hours of 2am and 5am on 6 November 2018 in Belfast, found 16 people sleeping rough, an upsurge from the five found during the same period in 2017, while the data collated by the DfC showed that the number of people presenting as homeless to NIHE fell by just 2 per cent from 18,573 to 18,180, in 2017-18. Of the 18,180 households that presented, 65 per cent (11,877) were accepted, with 26 per cent (4,688) rejected and the remaining 1,837 housed. Single males were the largest household category presenting as homeless with 33 per cent of the 18,180. Families were the second largest group, with 5,805 family units presenting, making up 32 per cent. The number of people within those family units was not specified. Sandra Moore, chief executive of the Belfast-based charity Welcome Organisation, says that the figures show that Northern Ireland is headed for a “perfect storm” of people with mental health or dependency issues falling through the netting of social housing. Done in conjunction with the Welcome Organisation, Queens Quarter Housing, Depaul, Salvation Army, Hosford House, Belfast Health and Social Care Trust and the PSNI, those found on the count were all previously known to the homelessness services and availed of emergency temporary accommodation. SDLP Belfast City councillor Paul McCusker says that it is now time for the Housing Executive to introduce and press ahead with their Chronic Homelessness Action Plan. “Agencies working on the streets have seen a marked increase of street activity with new people presenting and having to spend time on the streets,” he says. “Pressures on hostel provision have been a concern all year with NIHE being aware and the longer people spend on the street they run the risk of becoming entrenched. McQuillan says that the NIHE is “committed to the development of a Chronic Homelessness Action Plan as part of our response to the increasing complexity of need amongst homeless households” and that the plan will go out to consultation in early 2019 before being published.